Building new trails and improving existing pathways are among recommendations heading to Red Deer city council this month. The Recreation, Parks and Culture Board approved a trails and pathways master plan on Tuesday for council's consideration on Sept. 26. The proposal seeks construction of many kilometres of new walking, biking and nature trails in the next 15 years. If approved by council, the earliest implementation date would be after the 2006 budget is passed early next year. Recreation, parks and culture manager Greg Scott said he not only likes the plan for its vision but the fact it will define standards for his department and other departments such as engineering. Some 101 km of new trails are proposed, said Dave Matthews, a city planning co-ordinator who sits on the board. In addition, existing trails would be widened in some areas and existing shale paths would be paved. The plan, which took 17 months to formulate and involved much public consultation, calls for about $900,000 to be spent in the next five years. The 15-year plan calls for about $8.4 million in expenditures. 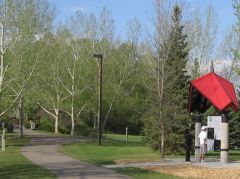 The largest estimated cost is $5.8 million for a pedestrian bridge connecting the Riverlands area on the West Park side of the Red Deer River to Bower Ponds. That drew the ire of board member Roy Bedford. He said he couldn't support the motion to council if it included the bridge. Bedford said he couldn't see spending that much money on a foot bridge when the city has to implement a lunch program to feed poor, hungry children and the city continues to come to grips with growing homeless numbers. Scott said later the bridge wouldn't be considered for about five years and still would need final council approval. - Centre lines on existing well used trail routes. - Snow clearing on a three-year trial period for a section of the Waskasoo Creek trail connecting Barrett Park and Coronation Park. - Park rangers who would be full-time, year-round for the entire trail system and full evaluation of trail signs. - New, unpaved nature trails within Maskepetoon Park, a treed preserve northwest of Heritage Ranch, and links to Oriole Park West and Bower Ponds. - A long trail that extends from Heritage Ranch to the Westlake subdivision and Red Deer College, crossing Taylor Drive and continuing across Red Deer's southern boundary, Delburne Road. - A new trail that cuts northeast through the Michener Centre grounds, crossing 30th Avenue and extending through new annexed lands near the River Bend Golf Course. Every community needs people who can take a good idea, hold on to it and patiently work it into completion. People like Bob Johnstone, president of the Central Alberta Region Trail Society. He's bought into the idea that a national network of cycle and hiking trails would be a great legacy, and he's willing to invest an awful lot of his time to help bring local sections of that network into existence. Red Deer's trail system added 29 km to that network last June, and a trail marker in Bower Ponds will be officially unveiled on Saturday. Dedicating already-existing trails into the Trans Canada Trail system is obviously a good idea. But the TCT -- the longest cycling/hiking route in the world at 18,000 km -- won't be a reality until a whole lot of new trail is built. Although Alberta already has about 600 km of the trail completed, we have a long way to go, because the east-west route across Canada makes an intersection in Alberta with the route heading north into the Yukon. That means we get the nation's largest provincial portion of the trail, which -- as Johnstone could surely tell you -- is both a blessing and a challenge. It's a blessing because Alberta will have access to one of the world's top new tourism draws of the millennium (about 62 per cent of our section of the trail has been completed), and because Red Deer will be almost in the centre of it. A recent Price Waterhouse study done in Ontario gives an indication of how big a deal this idea can be. They concluded that once Ontario's part of the TCT is complete, it will add about $2.4 billion in value-added income to the province's economy. As much as 42,000 direct and indirect jobs will be added to the economy, fueled by the money that people spend using the trails. British Columbia needed no such study to conclude that it would be worth $13.4 million to rebuild or refurbish 14 trestle bridges that were destroyed or damaged in the forest fires of 2003. The Kettle Valley Trail, that runs 450 km over old railway beds (and the trestle bridges in the spectacular Myra Valley canyon), is a key part of Central B.C. 's tourism plan. In fact, they are spending even more money to expand the trail to 700 km, linking other existing trails and 18 communities in their Spirit of 2010 project. Alberta's recently-completed Iron Horse Trail runs for 300 km, much of it on old rail lines and is designed for four-season use. It now links Waskatenau (and from there, the Saskatchewan portion), to Cold Lake and beyond, to be linked with Alberta's capital region of the CTC. It's already proving to be a huge tourism booster. Even though the experience of people living along trails shows that the trails produce far fewer problems than benefits, getting stakeholder support (which includes local landowners) is proving to be a slow process. Another roadblock to the easy linking of communities (and their local trail networks) is the policy of Alberta Transport not to allow trail development along highways to link communities. A media spokesperson for Alberta Transportation and Infrastructure maintained the policy is to address safety concerns. But if there's no trail along the road allowance of a highway, a cyclist or hiker would have to travel the highway itself. That can't improve safety. It certainly can't be because of the cost, because local trail committees actually raise money for trail construction and upkeep -- and the trails more than pay for themselves in increased tourist trade anyway. Just ask the merchants at Bentley, who prosper each summer from the roadside trail linking the Aspen Beach campground on Gull Lake to the town. Even so, some local highway routes are fabulous bike routes all on their own. One example: Hwy 951 north of Leslieville is one of the most beautiful country rides you could find anywhere, and it links wonderfully on a circle route on Hwy 51 east to Bentley or west and south back to Rocky Mountain House. There are many other such routes, that beg for a linked trail network. Consider the route following the Boomtown Trail southeast of Red Deer. How much more successful could that tourism effort be if the provincial government allowed some of the communities on it to be linked on cycle trails just off the highways? These kinds of local roadblocks might be enough to make some dedicated volunteers just give up and stay home. But people like Bob Johnstone just keep on working. That's why communities need them. The radical rise in the cost of gasoline underscores the need for communities to develop vibrant local, regional and cross-Canada trail systems, a trail proponent says. Bob Johnstone, president of the Central Alberta Regional Trail Society, said that not only are people searching for cheaper, yet effective, modes of transportation, they are looking for expanded recreational opportunities. Trials connecting points in a city such as Red Deer also need to link various communities, Johnstone said. A sign overlooking Bower Ponds will display the names of residents who have donated $50 per metre of trail. 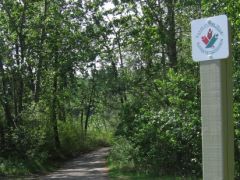 The sign will be unveiled on Saturday at 2 p.m.
Twenty-nine km of local trails have been registered with the Trans Canada Trail. The 18,000-km recreational trail will connect the two coasts when completed and includes 600 km in Alberta so far. Efforts by the society to link communities along Hwy 2A continue to run into roadblocks, said Johnstone. He said Alberta Transportation's policy is not allowing new trails along highways unless needed for safety reasons or as short connections between trails. Obtaining permission from landowners to develop new trails has also been a challenge. The society isn't dropping its Red Deer-to-Springbrook trail proposal. He said the society will continue working on Alberta Transportation and talking to numerous landowners for the link. He said landowners have legitimate concerns about safety and possible damage and litter. "It's frustrating at times, but I'm not a quitter and this is important for us. You just have to keep talking about the positive aspects to everyone." He said governments recognize the benefits of "active transportation." "When people walk or use their bicycle, the contribution to the environment means cleaner air, healthier people and a healthier planet. "If you're going to get the public to listen, it has to be something that is important to them. For some people, because of limited incomes, their choice of getting to work will be affected. "Hopefully they'll use transit or team up, car pool, and more importantly, bicycle. "Statistics show that people are willing to commute if they have a safe and fairly direct route to their destination." Johnstone said the city's master plan for trails and pathways is going to city council at the end of the month. A member of the steering committee, Johnstone said the plan, if accepted, will allow people to access many more destinations within the city. It has been developed with safety in mind. The master plan is partially based on a 2004 survey of more than 800 park users augmented by an open house and suggestions from the public mailed to the city. The survey revealed that trail users were captivated with the plants and wildlife, trail conditions, accessibility and safety. They suggested that money be spent on constructing more trails, as well as maintenance, lighting, stations offering drinking water and signs. "I live trails," Johnstone said simply as to why he became involved a decade ago in promoting trails. The 67-year-old retired child care worker has either walked, bicycled or in-line skated every metre of Red Deer's extensive trail system of 70 km of paved trails and 25 km of soft-surface trails. Johnstone's home in the Waskasoo area is near the hub of the city's trail system. He said people are constantly searching for new ways to keep healthy. "Not only are they exercising, they are experiencing nature when they use the city," he said. The trails are also an escape from the bustle of streets. "The trails are quiet. They are peaceful." "The great thing about trails is you can do it whenever, with whoever and for as long as you want."